Interests Homestar, MLP, Minecraft, Roblox, Sonic, Tails, Ristar, blah blah. Little Johnny's kindergarten class went to a prison to learn about criminals, and the police showed him a wanted poster of a criminal on the loose. "Why didn't you keep him when you took his picture?" he said. I've seen just about everyone with one of these. So I want one too, and they look REALLY cool! 3: TRY NOT TO LAUGH! MY BACKYARD IS ON FIRE! How do you do spoilers? I actually found that out yesterday, but thanks anyways. Appearently he was also on the cover on a christmas special but has no mention in the comic. The cover said "Christarmas is here!" Pretty good! You have some good characters and I would love to see 'em in an actual roleplay. Pretty good drawing. I should post some pictures here, of mine. I can not seem to upload pictures, help. I guess almost all of you have seen or made a fan character before. Maybe two. Or three. Or maybe four... but you know. 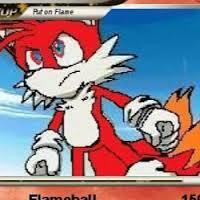 I have made a fan character named Flaretail and he's basically a recolor of Tails, but has fire-themed powers. (Also, for some reason he was born underwater and eventually learned to swim.) So I thought he should have a partner and a home, so I made Headshot (ANOTHER TAILS RECOLOR...) and a Rock Den in the Seaside Hills simply titled "Rock Den." Also has some BIG brains, he's really smart. So tell me what you made. Not sure if this belongs here, but oh well. About 4 months ago I saw Ristar in a comic! (Sonic the Comic.) It was actually a funny picture. If this was actually true, please tell me which comic # it was. P.S. Big fan of Ristar.